With the regular season complete, let’s take a look at the players who moved up the career charts this year. Players who were active this season are highlighted. This was a landmark season for a number of players on the scoring charts as Diana Taurasi pushed past the 8,000 point barrier while Sue Bird and Candice Dupree reached 6,000 points, and Angel McCoughtry, Tina Charles, and Candace Parker all crossed the 5,000 point mark. There will still be plenty of milestones for next season as Taurasi is poised to also hit the 9,000 mark and Cappie Pondexter will be trying to make one more push before the end of her career. Maya Moore should reach 5,000 points shortly with Sylvia Fowles not far behind. The newest member of this list is Monique Currie as 13 of the players were active this season. The story of the season in this category was Rebekkah Brunson’s chase for the career mark, which she surpassed late in the season. 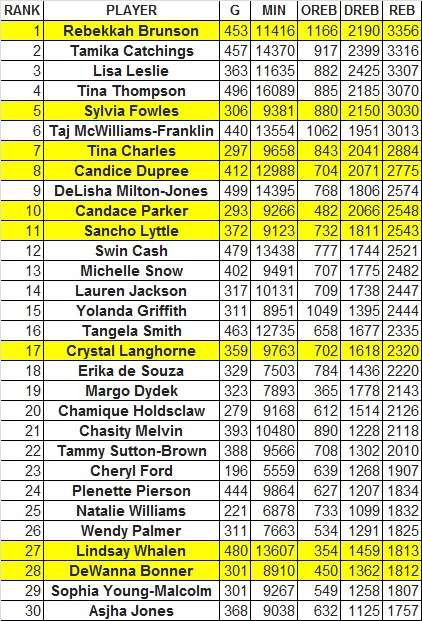 Tamika Catchings will have her career total chased again next season when Sylvia Fowles can pass it easily with a comparable season to this year after hitting the 3,000 mark. 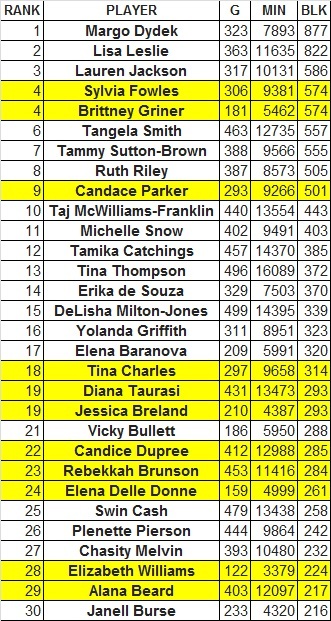 Tina Charles figures to be the next member of the 3,000 rebound club while it would take an impressive effort from Candice Dupree to be able to do it next year. DeWanna Bonner is the newest member of this list, while Lindsay Whalen was unable to move into the top 25 before retiring, making it easier for those just below this group to catch her in the future. For now, this remains a tough group to crack with only 9 active players. While four of the top six all time played this season, the attention went to Courtney Vandersloot, who assisted at an even more impressive clip this year than last year, propelling her into the top ten and probably within two seasons of the top five. 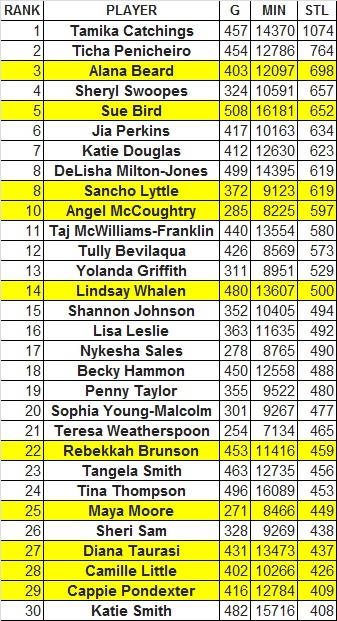 Tanisha Wright returned from a year’s absence to move up one spot in the list. 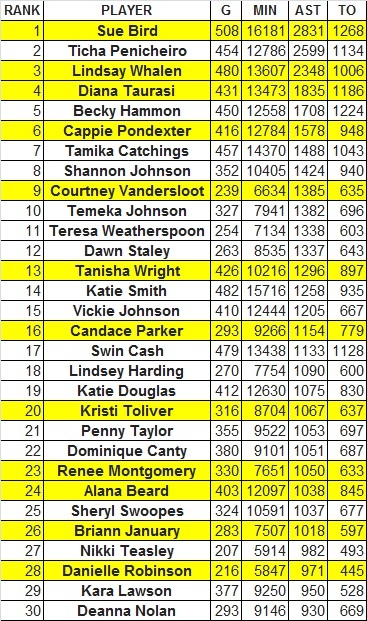 Four players reached 1,000 assists as Kristi Toliver and Renee Montgomery surpassed Alana Beard while doing so as Briann January entered this list for the first time alongside Danielle Robinson, who is still just short of quadrupile digits. Having 12 active players on this list has led to plenty of movement over the course of the year. 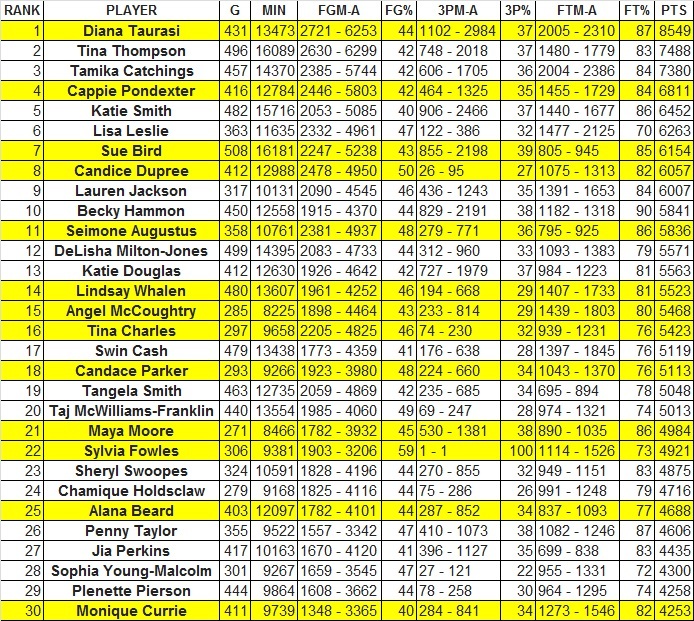 DeLisha Milton-Jones was bumped out of this group, leaving Tamika Catchings as the only player present on all five lists, although Diana Taurasi (Rebounds) and Candace Parker (Steals) should be in position to join that elite club. Margo Dydek’s record is still well out of reach, but Brittney Griner continues to beat her pace towards the top as she tied Sylvia Fowles this season in their mutual chase up the ranks. Candace Parker recorded her 500th block this year and Tina Charles reached 300. Elizabeth Williams joined the list for the first time, making it 11 active players. Nobody looks set to approach Tamika Catchings anytime soon, but the return of Angel McCoughtry did give us a new member of the top ten. Lindsay Whalen will finish at an even 500 for her career. Maya Moore is the newest player on this list, among 10 active players present as she and Cappie Pondexter were the latest to hit the 400 steal mark. A similar season next year could see Moore jump past a number of players well into the top 15.